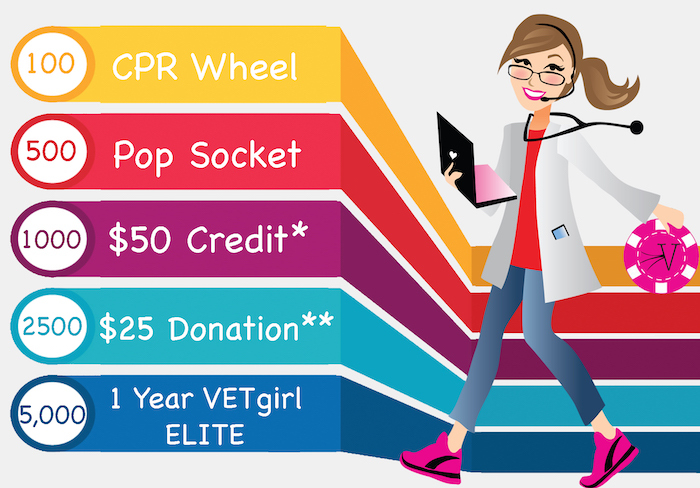 Win with VETgirl! The VETgirl TEAM wants to reward YOU for being a contributing part of the #1 online veterinary resource for busy veterinary professionals. When you weigh in on our new discussion boards, you earn V-Chips when you help inspire, educate, and connect with your peers. Every time you post a topic, reply to your peers, or interact on the message boards, you'll gain 1 V-Chip. The more you interact, the faster you'll be eligible for VETgirl prizes! Once eligible, email us at info@vetgirlontherun.com to earn your prize. Thank you for being part of this amazing educational journey! ** Towards your choice of of non-profits below.